None. Cleome cannot tolerate cold temperatures. Tomato, Dahlia and Cosmos. Cleome looks best when planted in large clumps or masses. Tall varieties make great flowers for the back of the border. Sow cleome seeds indoors in moist seed starting mix, or wait until the soil has warmed and sow the seeds where you want the plants to grow. Dwarf varieties can sometimes be found as bedding plants. Allow 12 inches (30cm) between very tall varieties. Despite the beauty of the blossoms, cleome is seldom used as a cut flower because of its acrid aroma. Some new varieties do not have this problem. 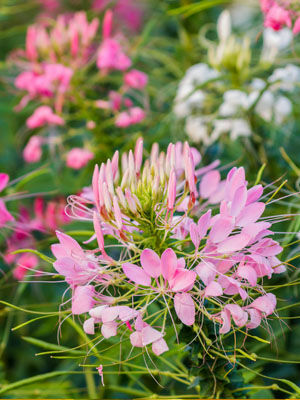 Cleome colors include pink, white, and lavender. Snip off spent blossoms to keep plants looking neat, and to prolong flowering. Tall varieties may need staking. As cleome plants mature, the lowest leaves wither and fall to the ground. Grow a mound-forming plant in front of cleome to hide the lowest sections of the plants from view.